The people of Tekoa are safer because of you! Life is anything but boring for the people of Tekoa. The Gush Etzion community of Tekoa was founded in 1977 by new immigrants from the Soviet Union. These pioneers were soon joined by native Israelis and immigrants from other countries to create a neighborhood that is as varied in background as it is in lifestyle. The people of Tekoa embrace their community’s diversity and treat their fellow residents with tolerance and mutual understanding. Since the outbreak of the second intifada in 2000 the community has faced ongoing threats of terrorist infiltration as well as dangerous situations on the neighboring roads. Indeed, Tekoa residents have been attacked and even murdered in a number of incidents over the years. 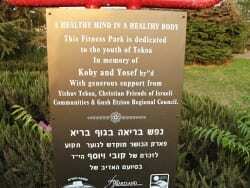 In May 2001, Koby Mandell and Yosef Ishran, two local boys, were attacked and murdered by Arab terrorists while hiking just outside the community. Their young bodies were found in a cave just 200 meters from their homes in Tekoa. Then in September of that same year Sarit Amrani, a young mother of three, was shot and killed on the road on her way back to Tekoa. Somehow, incredibly, life in this community continues. The community has grown significantly in recent years and the local elementary school has more than doubled in size. The people of Tekoa gathered the strength to keep going, working, building, believing that settling the land and raising children in the Biblical heartland, with their strong values, are the best ways they can contribute to Israel’s future. For them, living in G-d’s Promised Land is not easy, but it is purposeful. During the most recent wave of terrorism, the people of Tekoa once again found themselves the target of Islamic terror. On January 18, 2016, a pregnant woman was stabbed in the Tekoa shopping center when a terrorist managed to infiltrate the community. There continue to be numerous firebomb and rock throwing incidents on roads leading to the community. In one such incident CFOIC Heartland friend and volunteer, Aviva Yisraeli, was hit and lightly injured. Aviva and her sister were driving with their two young babies in the car, on their way home from a doctor’s appointment, when a Palestinian teenager suddenly appeared from behind one of the cement security barriers lining the road and flung a heavy rock at their car. Aviva’s window was hit. Her shoulder was injured and her sister was cut by the shards of glass. Thank G-d, the two little babies were unharmed. Since this frightening incident, Aviva carries a handgun for protection, but she is reluctant to drive on the roads adjacent to her home town. As a result of this and other such incidents, earlier this year the people of Tekoa turned to you with an urgent plea for funding for surveillance cameras, to be installed at two strategic points on the road leading to the entrance of the community. This vulnerable road is where one terrorist chose to hide before infiltrating the community last year. And it has also been the location of several drive-by shootings, including one that landed Aviva’s friend in the hospital and the one that killed Sarit Amrani back in 2001. Thanks to you, our wonderful donors, CFOIC Heartland was able to come through and raise the funds needed to complete this project. Each dollar that was given by you was matched by the regional council and the government. That means that your donation had triple the impact. Today, the cameras are already installed and doing their job. Footage is monitored by both the army and the community. Not only have security personnel been able to identify rock throwers, they have also been able to identify where the terrorists are coming from. And that information is key to preventing future attacks. The people of Tekoa thank you for your amazing support. You have helped to make this wonderful community a safer place for its residents, people who have endured so much, and yet continue to call their unique community in the Biblical heartland home.